The Young and the Restless star who plays Victor Newman, Eric Braeden, has insulted Michael Muhney and all of his supporters by attacking a fan on Twitter. Call me crazy, but I happen to think that when you have worked in Hollywood for as long as an actor like Eric Braeden has then you should know how to carry yourself, period. Show up on set, do your job, be respectful of coworkers and be grateful to the fans that have secured your job – especially in daytime television. Let’s face it, soap fans are some of the most loyal and vocal around and if an actor has their die-hard support then they will continue to be employed for as long as they want to be. 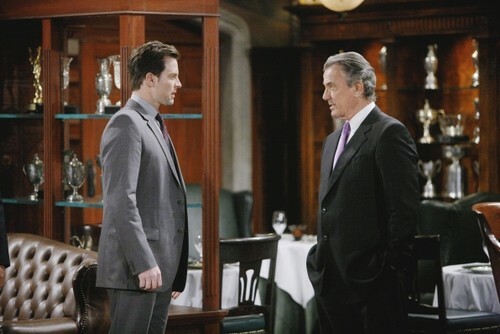 Eric has been no stranger to drama in his 34 years on The Young and the Restless. He might be a nice man at times but more often than not his arrogance seems to arrive in a room a few seconds before the rest of him does. 20 years ago he had a legendary fistfight backstage with Peter Bergman that left both actors suspended and warned that they’d be fired if it happened again. Eric learned his lesson and quickly realized that keeping his hands to himself was necessary but words, well words are a razor sharp weapon, ones that Eric seems to believe carry absolutely no consequences. In the last six months it has been widely rumored that Eric had a hand in the firing of Y&R favorite, Michael Muhney. Of course he denied it but for months leading up to Muhney’s Dec. 2013 dismissal there were definitely rumors of the two men fighting and being at clear odds with one another. Looking back over the years Eric seems to have a real problem with any younger man who can act his way out of a paper bag while flexing his muscles. His conflicts seem to reek of good old fashioned jealousy and tonight a Twitter follower got the better of Eric. @dgtronic dared to ask Eric how Michael Muhney is doing since he helped get him fired and the reaction, well it was a huge mistake on Eric’s part because news sources such as CDL screen-capped it ensuring that it lives forever. Eric told @dgtronic that he is totally uninformed and then flat out called the tweeter an “idiot.” I realize that in his own mind Eric thinks he is far better than @dgtronic, me and everyone else reading this but in reality, he represents a brand. That brand is CBS which produces The Young and the Restless. He either does the network justice and makes them look good or else he is capable of tarnishing CBS and the good name that Bill Bell worked so hard to create with Y&R. Insulting the fans that tune in, who boost the ratings, which mean advertising money that ultimately is used to write Eric’s nice fat paycheck is simply unacceptable. 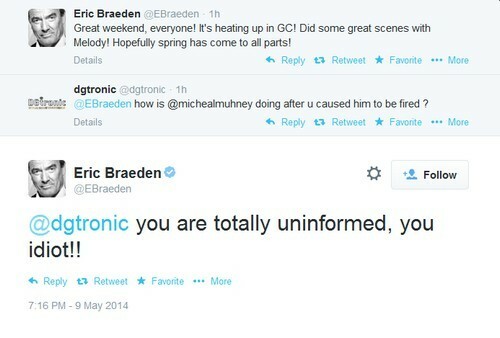 I’m curious as to why even months after MM’s firing Eric’s temper would flare over anything connected to Muhney. It sounds like there was some sort of emotional investment in the situation otherwise this tweet would have rolled right off his back, don’t you think? An appropriate response could have been something like, “we were all sorry to have lost MM – circumstances beyond my control led to his leaving the show and I was personally sorry to have lost a very talented cast-member of Y&R.” Eric could have shown some class. Instead he insulted the fan who tweeted, Michael Muhney, and all of Michael Muhney’s fans and supporters. Why is it that Eric acts like an “idiot” on a regular basis but never seems to face any consequences? The Young and the Restless’ ratings are dropping like crazy. They cannot afford to have one of their senior actors publicly insulting even one would-be fan, and especially not over Michael Muhney. MM’s fan-base is tremendous and still very angry about his shabby treatment by Jill Farren Phelps and Y&R. Why is this egotistical windbag poking the bear? Too much is at stake and perhaps it’s time that Eric face some serious repercussions for his behavior, don’t you think? Tell us your thoughts in the comments below! I haven’t watched the show in almost six months now. Eric Braeden’s response here doesn’t surprise me whatsoever. He is a very jealous, angry, arrogant old man who will never take accountability for his deplorable behavior. I just saw the other day the ratings continue to drop. Since Billy Miller and Michael Muhney left YR, they are down a total of 1.2 million viewers. That is a significant number. If EB can’t take the heat, he should get out of the kitchen! Eric needs to be fired without pension now. I will never watch Y & R if he is not. I’m done. Y & R is on the way to soap graveyard. Good bye you arrogant old man. When in a hole ,stop digging…. What do you think? Could Eric be any more obvious about his disdain for MM?